Texas Freckles: One Inch Hex Starter Pack Giveaway! Are you brave enough to tackle the one inch hexagon? C'mon, you know you want to! To get someone started, I've put together a little one inch hexagon starter pack. It contains 100, 2.5" squares of printed fabric and a package of 100 die cut 1" hexagons. 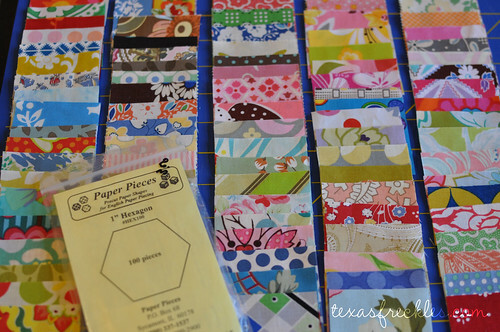 What a great way to get started on your charm quilt or to use in a smaller project. While the majority of these fabrics are unwashed (I'm not a die-hard pre-washer; don't hate on me), they are all quality quilting cottons from great designers. There's some older Amy Butler and even some Flea Market Fancy in there! If you want another chance to win, become a follower of my blog and leave a second comment. If you are already a follower, leave a second comment to let me know that too. I'll draw a winner on Friday, March 26th and I'm willing to ship it anywhere. While you are here, check out the Hexagon Charm Quilt Piece-Along here and over at flickr. Good luck! Oooh, a lovely giveaway! I was going to start some hexagons today but my printer wouldn't work! I used to sew them when I was a girl so they bring back memories for me. Happy Find, here... I've visited your blog many times before and your hexagon charm quilt is beautiful. I'm just now dabbling in quilting and what you've done is just inspiring. Oh, and happily I am already a follower of your wonderful blog! 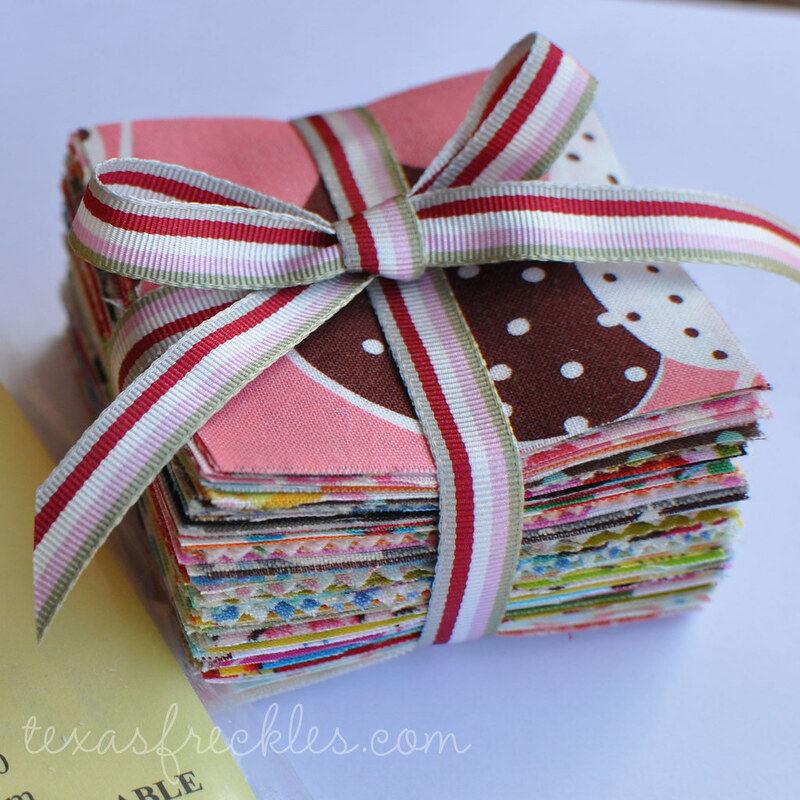 This is such a fun project and giveaway! Love the blog! Mmm... this is just the project that I'm looking to tackle next - totally hope to win. Wow, what a generous give-away. I am so impressed with all of the hard work you've put into your Charm Square Quilt Along. And I can't wait to see your quilt progress. I'm a follower - I came over from Flickr after you posted your gorgeous Paint Along Blocks. Oh how fun! What a great giveaway! Your quilt-along sounds like fun... I don't think I can manage to avoid duplicate fabrics though! Good luck on yours. p.s. I've subscribed to your blog through BlogLovin'. Does that count as following? *grin* That would save me a lot of cutting.... Much thanks for the opportunity! ooo how wonderful!! I have a bunch of one inch hexes and I've been waiting for more fabric in my stash to ad to them. This would be the perfect way! You've done all of the hard work - I'd love to win this! Of course I follow your blog. How could I not? Ooh so fun! Yes, please pick me!!! I have been following your blog watching these beautiful babies being born. It has peaked my interest to do this myself... and NOW, you are being even more tempting by adding this giveaway... Thanks!! Just stummbled across your blog from one of your flickr pics. GREAT giveaway!!!!! I am currently working on a 30's hexagon project and am so addicted. I'm thinking of joining your Quiltalong, but then I'll have two hexie projects going. I think that might qualify as obsession! and I'm signing up to follow your blog, I have been a "lurker" for awhile....but now I'm out in the open. I am a new follower to your blog and a Texan as well. I love what you do and you are inspiration to me way out here in California!!! Wow, you have done half the work! I guess I will take the risk of getting addicted and enter your sweet hexagon giveaway. I want a hexagon project for a summer road trip! This would be soooooo great! I'd love to have this! I recently gave my two weeks notice (one week down, one to go!) and I could really use a creative distraction! I'm also ALREADY :) a follower of your lovely blog! Wow! This is a sweet giveaway. I'd love to win this to get me started in the hexagon craze. I've already started, but more fabric is always appreciated. this looks liketoo much fun to pass up, please add my name! I'm dying to try hexes and would love to win your kit! I'm a follower now, too! oh I would LOVE to win! I've become a follower form over the ocean, but if I did win you wouldn't have to ship it over the ocean, our parents ration packages out to us! love love love the new way quilt! you really have great fabric choices and a fun blog. I'm desperate to try some wee hexagons (like I need another project!) and that is a gorgeous wee bundle! Great giveaway, I have been following your Hexagon fixation for the last few days. I'm fascinated but a bit 1afraid to get started (and addicted). I've been wanting to try this hexagon thing since you first mentioned it - great idea! I love hexagons and would love a little kit to get me started on them again. They are great to keep in my purse and work on whenever I have time. I also signed up as a follower for your blog. Lots of good stuff to read. Thanks! I would love to win this!! I have been sewing hexagons for about a week now and am completely addicted -- thanks to you!! Please put my name in for the giveaway. I've always wanted to tackle a hex quilt. I'm now following you Mel! That looks like so much fun! Especially the part where I wouldn't have to cut my own squares or hexagons! Melanie this is so cool! I just started some hexies last night! Will be blogging it tomorrow morning :-) I think I'm addicted! Such a great giveaway! oh, and of course I follow your blog! I love the idea that I wouldn't have to do all of the cutting, since that's my least favorite part! I'm new to your blog and am loving it! What a fun giveaway! I've always wanted to try hexies. I just found your site and am new to the love of hexagons, so this would be an incredible win. Thanks for the inspiration...I need a project I can "take along" when in the car. wow, i'd love to give this a go! I am a brand new follower and already love your work! I've always wanted to try a hex quilt... this would certainly give me that boost! fun giveaway! I haven't done a hexagon before - what a great way to start!! and I already follow you ! What a fabulous giveaway! And a great quilt along!! I can't wait to learn Hexagons! I've been thinking about it for awhile now and I am ready to take the plunge. Thanks for the chance to win. What a great giveaway thanks for the chance to win. Wow - what a wonderful giveaway! I would be very excited to win - I am off to check out your piece-along. I am a new follower. thanks for a wonderful blog. This hex craze is very intriguing...I think I may have to try it! Thanks for all the inspiration! I´m a new follwer of your lovely blog! Such great inspirations! Lots of patience you must have to cut all of those little squares! Thanks for a great giveaway! I love the fabric choices! I'm in. Fab giveaway - I love hexagons but have never tried such tiny ones. I have just become a follower of your blog too. I have always wanted to try hexagon quilting. Thanks for the giveaway! Wowsers! I'm fairly new to quilting and am looking for my next challenge. A hexagon quilt would be ACE! Thanks. Just became a follower. You quilting girls are amazing! Inspiring stuff. wow, what a great give-away, thanks so much! This is a fun generous gift! And I follow you now, how could I not? You have such fun stuff. I've just found your blog, your work is amazing! Of course I'll become a follower, I don't want to miss your new projects! Now I'm oficcially a follower! Your giveaway is lovely. Alright...I'm game. The perfect project for sitting at the pool or tv watching. I have joined the followers! I think I'm going to try this. It'd be nice to have some pre-cut squares (wink, wink). Perfect project for sitting through volleyball practice 3x a week! I'm off to buy some supplies! What a great giveaway! Hexagons are on my bucket list of quilting! And this would be the excuse to get started with them! What a great giveaway! Thanks for the chance to enter. I'm new to this hexagon thing! Oh it looks so addicting! I'd love to win your giveaway! I'm now following your blog! :) I'd love to win this hexagon giveaway! I'm a new follower! Lovely blog and thanks for a great giveaway! Making hexagons has been on my want to do list for some time. It seems like it would be a great toteable project. thanks and I've add your blog to my reader account. This would be the perfect excuse for me to start making these very tempting hexagons; I've been thinking about them for awhile, but all of my other projects make me feel a bit guilty! ...these lovely little things are what brought me to your blog, and led me to follow it. I would love to see if these are as addicting as everyone says! Your hexagon charm enthusiasm has really infected me, I'm beginning to obsess. Oh, and I added you to my Reader subscription the moment I discovered you. Ohh- I love hexes but my scrap stash is lacking so there isn't a ton of variety so far. So much like a drug dealer trying to get someone hooked. Poor me, my weak will power and addiction for fabric, I just can;t say no to such a great giveaway. I would love to win these - everyone says how addictive they are and I am looking for a hand-sewing project to work on when I don't feel like hauling out the machine. Oh, oh, pick me! Well, now you have me interested in this! I love hand work but usually just keep some mindless knitting around. This looks like fun and something new and different. Count me in for the giveaway, please? Thanks! so many pretty things :] I would love to win! i have been wanting to try my hand at some hexies! What a fun giveaway! I would love to try hexagons! OMgosh what a great giveaway! I have recently been smitten with hexes. Perfect timing! yes! i would love a chance to work on hexes...they are so darling. I found your giveaway from jaybird, thanks for the giveaway! I am sew happy that I stumbled upon your blog. I am now a follower. Thanks for the wonderful inspiration. I can't wait to see your finished quilt. Love the hexies! I am working on a one-patch of hexies using 2" hexes. Would love to make one in all those cute fabrics though! SO bright and happy! I signed up to follow your blog! Thanks! These would be great! I've never done a hexagon quilt. Thanks! anything that tiny is guaranteed to be amazing! Ooohh, fun! Those fabrics are so pretty! What a great giveaway! I've never tried Hexagons before, this looks like a great way to start. I follow your blog via Google Reader. Very fun to read about your projects! Sounds like a great way to try out hexi's, with part of the job already done for you!! Thanks for the chance at winning a fun new project! Oh! and I became a follower of your blog! Ooh I love hexies! Awesome giveaway! ooooooooo! What a great giveaway! Thank you so much for the chance to win. And NOW...I am a follower of your blog. I am so excited to see more of it. I've never made hexagons before. You give me the materials & I'm in on the game!! Trying Hexagons sounds like some fun! Never done them before. I would love a chance to win! Thanks for such a great giveaway! Great giveaway, I'd love to try some hexagons! What a great giveaway - would love to try some hexagons!! Hope I win! I love hexes!! This is such a great giveaway! Thank you! I would love to try this! What a great giveaway, thanks!! I love hexagons! What a fun giveaway! What a great giveaway...I have been itching to make a hex quilt!!! Great give away! Love those fabrics! Nice fabric giveaway! I found you via Jaybird Quilts. Thanks! Ooh! Hexes are on my to-do list! I would LOVE this kit! I want to win! What a great giveaway!